Have some fun with zombie-like covie reinforcements in the hillside survivor area! In the hillside survivor area, a covie dropship eventually brings in some reinforcements. But you can arrange for them to be strangely inactive, just standing around passively, letting you get up close and have some fun with them. Very easy too! Here's my suggested method, demonstrated at the start of BCM313. Armed with a sniper rifle, drive to the high entrance of the hillside area and snipe covies, reducing their number to 6 or less. There are 13 on Heroic and Legendary, 14 otherwise. Kill them all if you want - especially if you prefer not to be pestered by stragglers later. 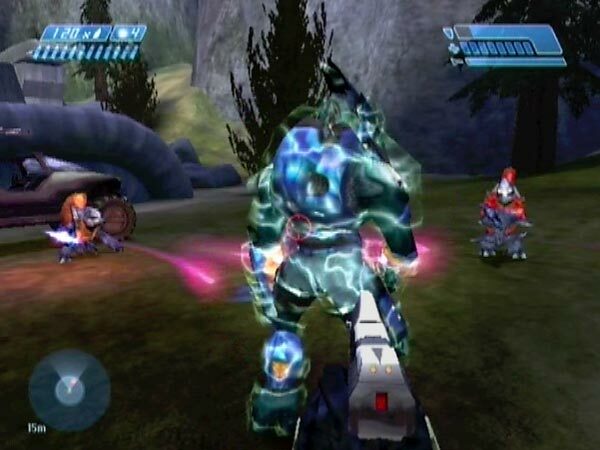 Also snipe any Marines you can see in the distance ; preferably get 2 at least. There are 3 on Heroic and Legendary, 4 otherwise. Drive to the hilltop. Because of the reduced enemy count, a covie dropship will be triggered shortly. It could be immediate or you may have to wait for a Marine to talk to you if you left any alive. When it spawns, kill any remaining Marines within about 15 seconds. Specifically, I think they need to be dead by the time the ship is about to start its final descent (sinking down vertically). You can drive promptly to the landing zone to see the reinforcements jump down if you want, but don't draw fire from the ship before its final descent, and avoid going too far towards the nearby entrance too early, else the occupants may turn out normal (i.e. active). On Easy or Normal you get 2 Elites and 5 Grunts, on Heroic 2 Elites and 4 Grunts, and on Legendary 3 Elites and 3 Grunts. Note: when killing Marines there's a danger of acquiring traitor status, but it's a bit random. While on foot, be careful you don't get chain-gunned if you brought a gunner along! Having passengers is fine though. They're nice to have as company, and they don't usually target the inactive covies. There's a checkpoint associated with the dropship spawning. Assuming you get that, you'll be able to repeatedly replay from there if you want. The checkpoint is fully delayable though, so you actually have the option of delaying it until you're at the drop zone. The easiest way to do that would be to proceed on foot, jumping. Another checkpoint option is to get one at the entrance near the drop zone. However, such entrance checkpoints are only briefly delayable. The covies basically just stand around, facing a particular direction (opposite to the ship's direction when it dropped them). They recoil and cry out if you shoot or whack them, but they don't appear to see you, and Marines don't appear to see them, though they'll celebrate deaths. Also, the covies don't seem to give their usual complaint lines when attacked. E.g. you won't hear a Grunt say "Hot hot hot" in reaction to a shot from a plasma weapon. You only get cries of pain. I'm also not hearing any idle sounds from Grunts (sniffing or grunting and suchlike). The covies' inactivity gives you a novel chance to get up close for a good look, and to play around with shooting them or launching them or whatever. 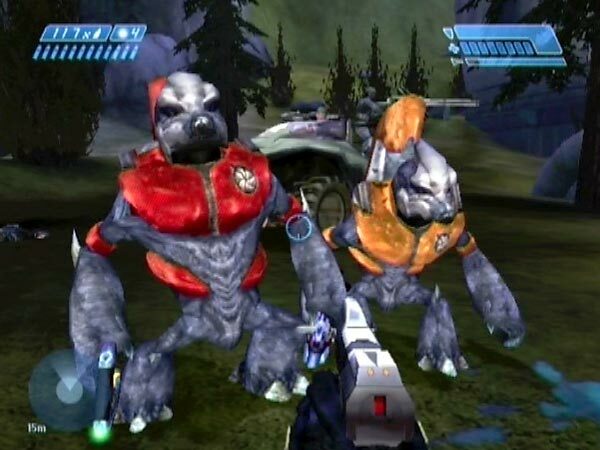 The Grunts are pretty cute, looking around and occasionally jumping up and down as if to keep the circulation going in those little legs. Inactive covies also make very convenient subjects for testing resilience against various weaponry, if you're interested in Halo details. Moving them; major creative potential! 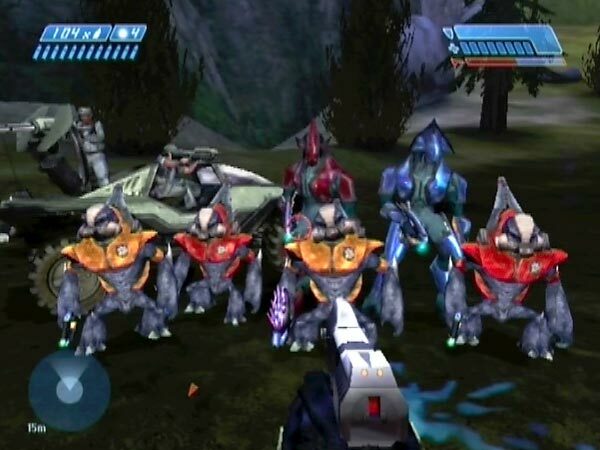 They can be pushed around with a Warthog. It's a delicate business and you'll need some patience, but it's full of potential for setting up amusing situations. I showed some examples in BCM313, including four Grunts in a line so I could snipe them all with one round. You could do some sort of formation launching too. Also see BCM314 in which I got covies into the lifeboat and had some fun with them. In creating novel arrangements, you can checkpoint intermittently so that if you accidentally splatter anyone, you can revert without having lost too much work. One other way to shift a covie is to make him recoil from a whack or shot. That can be handy on occasion. By positioning your Warthog appropriately at the drop zone, you can potentially get one or two dismounting covies to land on it, which makes an amusing sight. In particular you can get two Grunts. The position of such a covie can be adjusted by making him recoil from a shot or whack, if needed. Sadly you can't take them for a ride though; they just slide off. 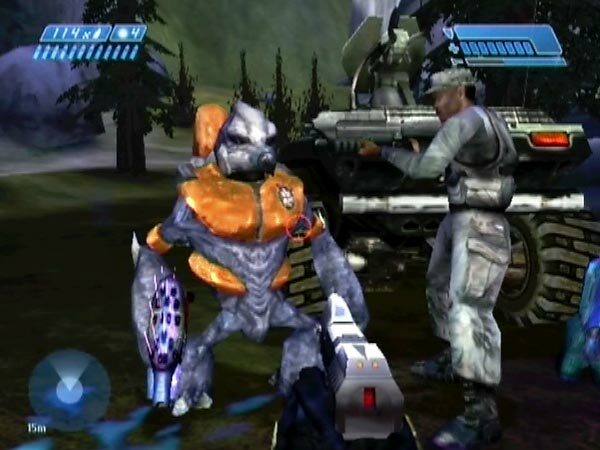 Grunts sometimes fall off because their on-the-spot animations make them gradually shift. If you're at the landing zone as the ship comes down, you can whack Grunts dead before they hit the ground. It's possible to kill two in quick succession. You can also enjoy watching out for Grunts doing a cute somersault dismount. If you left any of the original covies alive, you can amuse yourself by using an inactive covie as a shield, trying to get him killed. 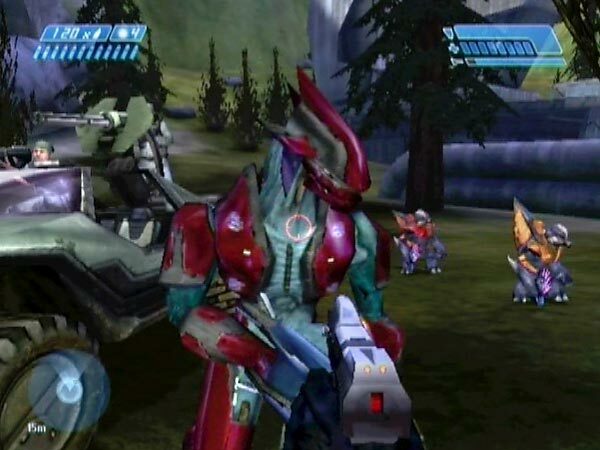 A needler Grunt (or possibly two) makes a good attacker in this regard. He'll keep hitting your living shield and saying "It wasn't me" and suchlike. You could also try to make him grenade your shield. 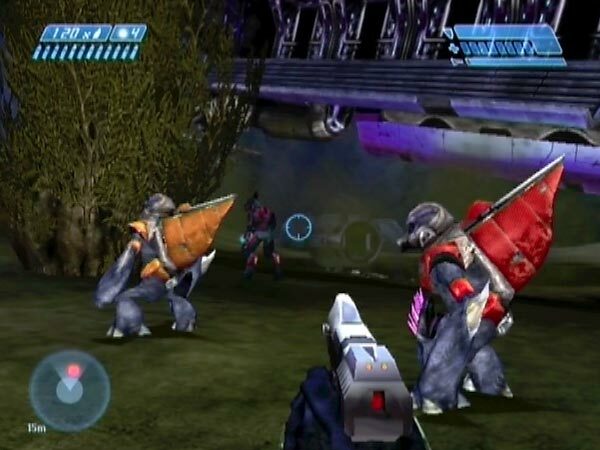 Incidentally, when using a Grunt as a shield, you might want to crouch. If you've reduced the enemy count to five or less, a few minutes later (typically about 2:45 I find) you can expect to hear Cortana say "Cortana to Echo 419. Stay on station Foe Hammer, we have no survivors for pick-up." Thereafter, the remaining covies are prone to being removed by the game when out of sight. If you look away for a few seconds then look back, one or more may've vanished! This is unrelated to their inactivity; it would happen also with normal covies. Essentially, the game is cleaning up in regard to stragglers. The issue needs to be borne in mind if you're planning on doing some covie moving which will take a while. You're not going to be too pleased if your covies start vanishing when you're part way through a long job! At the drop zone you may hear an unseen dropship humming, out in the valley. It's near the right entrance to the cliffside survivor area. If you want to make it depart to get rid of the hum, simply look in its direction for a few seconds. Weirdly, that seems to work (saving you from needing to head outside). Normally Marines don't target the inactive covies, but it is possible. I've experienced that at least once, when I ventured relatively near the lifeboat before the ship was down. There might be something partly random going on in that regard. My suggested method is what I find most convenient, but you could work other ways. 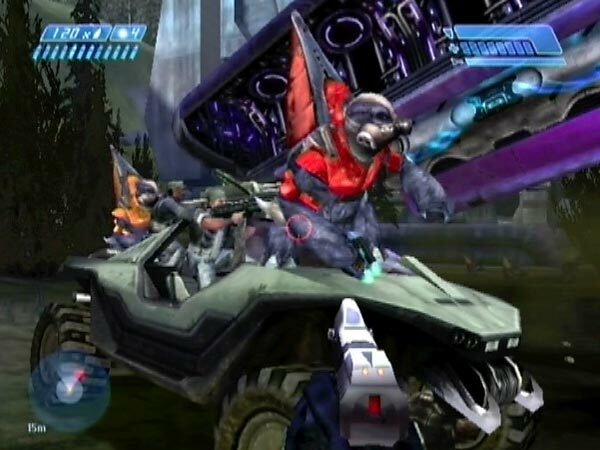 For example you could drive to the hilltop, kill a few of the Marines, snipe covies until the dropship is triggered (namely when the enemy count falls below 7), then finish off the Marine survivors before the ship starts its final descent. I did some investigation to try to fathom exactly what's needed to make the reinforcements inactive, but I wouldn't say I have the full picture, and I think it would take quite a bit more work to establish that. One auxiliary thing I'll declare though, is that the dropship triggering depends on two things. You need to've approached the hilltop, and the enemy count must have dropped below 7. Note: In BCM313 there was one Marine left on the hill when I drove up, and (as per my suggested method) I waited for the ship to spawn before killing him. Actually, you can potentially still get inactive covies even if you kill a final survivor as soon as you reach him; but it seems fickle. I'd been thinking I might be able to get some inactive Jackals by varying the method a bit. Here's why. 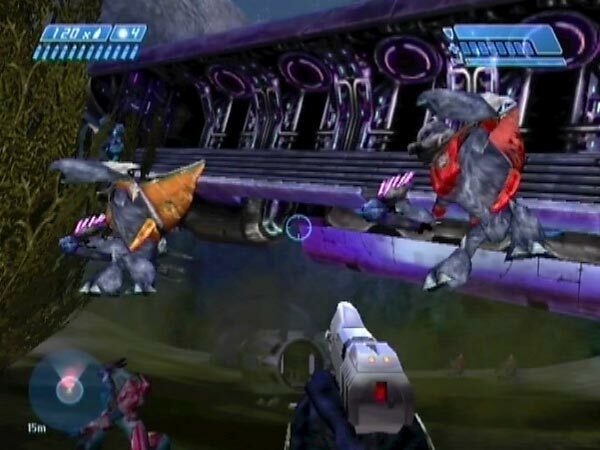 If you're near the tunnel entrance when the dropship is triggered, existing enemies seem to vanish and the mix of dropship reinforcements seems to differ from what it would normally be, and can include Jackals. However, I tried various things but still wasn't able to get inactive Jackals. If anyone finds a way, do tell!